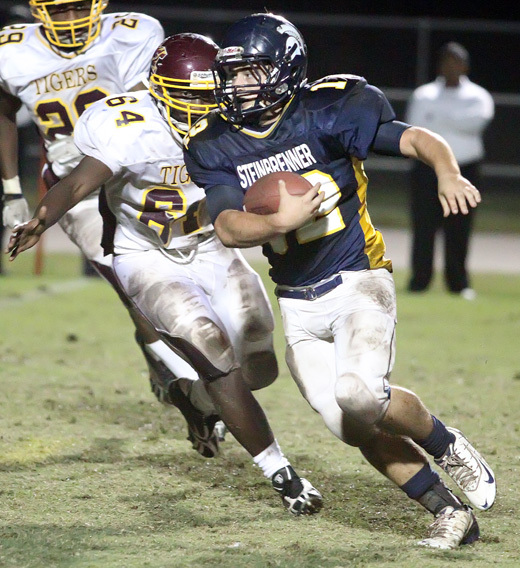 LUTZ – When the final whistle blew to finish off the Steinbrenner football season, no one wanted to leave. As the fans filed out of the stadium, the scoreboard was shut off and the lights above the field were dimmed. Yet, there sat seven members of the Warriors’ second ever graduating class, some even lying down to stare up at the night sky and praying it never had to end. “I wish I could just spend the night here,” said senior Danny Fernandez, who transferred to the school his sophomore year fromJefferson. The Warriors captured their fourth shutout, a school record, and best season in school history with the 43-0 win over the Middleton Tigers. Steinbrenner (7-3) controlled the pace of the game throughout, with the usual rushing attack. However on the Warriors’ second and third possessions of the first quarter, it was the rare passing threat that caught the Tigers (0-10) off-guard. After halfbacks Kendall Pearcey, Zack Jones and Cody Cazin set up the Warriors in good field position, sophomore quarterback Curtis Fitch found wide receiver Josh Roberts on the outside for a 25-yard pass completion for a touchdown. After both teams went three and out on their next drives, Pearcey found a hole and sped his way for a 20 yard gain. Jones would add 11 yards more with his rush, and Fitch would find Pearcey for a 35-yard touchdown, his second of the night. On the Warriors’ ensuing possession, Pearcey would go down hard and stay down for several minutes as trainers and coaches attended to him. He would be carried off of the field and was diagnosed with a high ankle sprain. Pearcey would not return to the game. Filling in for the injured Pearcey, senior Brian Gainer picked up where the junior left off by earning a quick 15 yards on his first touch of the game. The second wasn’t so bad either, as Gainer was off to the races after bouncing off of a couple Middleton defenders to extend the Steinbrenner lead to 23-0 at halftime. In the second half, the Warriors picked up right where they left off. After the Tigers were forced to punt, Gainer made the Middleton defense pay on Steinbrenner’s next possession. After an eight yard gain, Gainer finished his night with a 40 yard touchdown. In the fourth quarter, Cazin, a linebacker turned halfback, wanted to get into the end zone for his first career offensive touchdown, and he did. After three attempts by the senior, Cazin finally punched it in from five yards out. The Warriors would add another touchdown late in the fourth, when senior defensive lineman Zack Boryla forced Middleton quarterback Antonio Brown to fumble the ball in his own end zone which Boryla recovered. Middleton’s only threat to score the entire game was in the fourth quarter, when the Tigers drove it all the way to Steinbrenner’s 15 yard line. However, the Tigers were picked off by Andrew Feldhaus to seal the shutout for the Warriors and seal the first winless season in Middleton history. Yeah it did sound like a very exciting game to watch. Warrior football had an awesome season for a new program and the team definitely has a bright future ahead of them. I think it was a good game to watch.